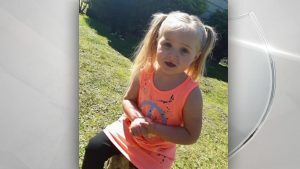 DOUGLAS COUNTY, Ore. – An abducted 3-year-old girl was found safe in Douglas County. Police said 3-year-old Ryklin Monroe Anderson was taken by an unknown man and woman from a home in Oakland, Oregon at about 11:19 a.m. Tuesday. The suspects who took Ryklin were considered armed and dangerous. Police asked for help searching for a silver Toyota Carolla with tinted windows and a sticker of the State of Oregon on the back window. Just before 2:00 p.m., the Douglas County Sheriff’s Office announced Ryklin was found safe. No further information was provided.